Whatever their specific tactics, these communities prove that a holistic approach is needed to solve environmental problems and make cities sustainable. Beatley and these esteemed contributors offer vital lessons to the domestic planning community about not only what European cities are doing to achieve that vision, but precisely how they are doing it. The result is an indispensable guide to greening American cities. 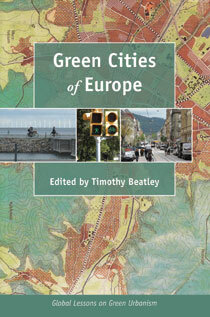 "...an important update of his solo-authored 1999 book, Green Urbanism: Learning from European Cities." "[Beatley's] wide-ranging reporting and analysis of green-urbanist work, including his channeling of crucial ideas of campaction, is foundational for clear thinking on the subject." "This is essential reading for all those concerned with urban sustainability." "Beatley makes a convincing argument supporting his contention that European cities are world leaders in sustainability efforts...Green Cities offers detailed insights into what some of the leading European cities are doing to promote sustainabiltiy." "The book includes many wonderful ideas and imparts a general sense of optimism; it will be a useful supplemental resource for students in urban studies programs." "Green Cities of Europe is the long awaited and much needed sequel to Beatley's pioneering Green Urbanism: Learning from European Cities. His updated overview of Europe's leadership in green urbanism is enhanced by case studies from practitioners and scholars who know these places so well." "Timothy Beatley understands that sustainability is about building for the long term, and in assembling this important volume he has selected inspiring examples of durability and resilience in city building and place making. He gives us all reason to hope for our own cities." "Few books I use both in the classroom and in practice have had the level of transformative, transferable impact as Timothy Beatley's Green Urbanism. Now, with the expanded in-depth case studies presented in Green Cities of Europe, our toolbox for illustrating substantive change is redoubled." "I've not yet visited Europe so I don't have personal experience to draw from, but now I want to go more than ever." "...an encouraging read on 'the art of the possible'..."
Chapter 1. Introduction: Why Study European Cities?